Camacho 5-Pack + Scorpion Lighter Free With Purchase! 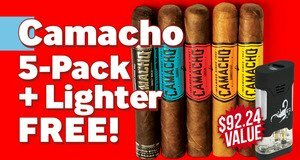 Buy a box of Camacho Triple Maduro, Camacho Connecticut, Camacho American Barrel-Aged, and Camacho Criollo cigars, get 5 Camacho cigars + Camacho Scorpion lighter, valued at $92.24, absolutely FREE! 5 Camacho cigars + Scorpion lighter free with purchase!